Microsoft Dynamics 365 has no reliable built in scheduling mechanism that can be leveraged for custom solutions. The Asynchronous Batch Process Pattern I have written about in the past can be used with daily recurring jobs but when it comes to hours resolution and less, it becomes unsteady. 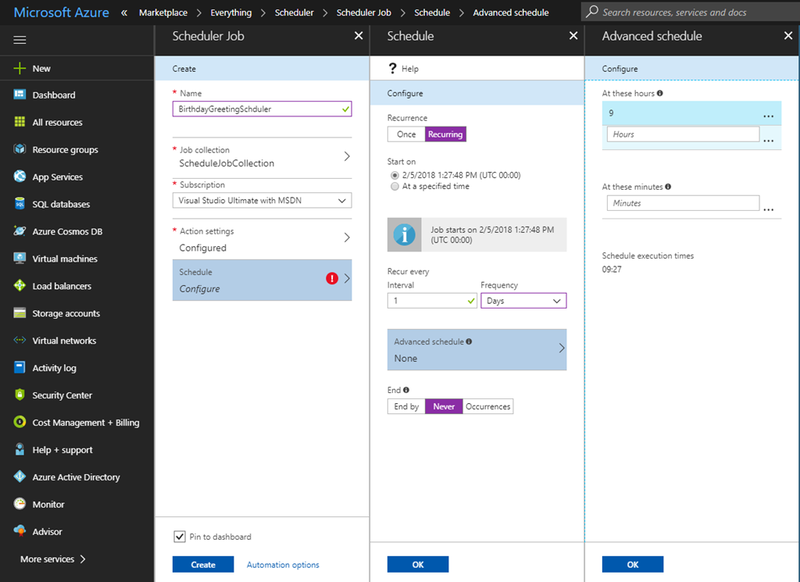 Azure Scheduler is a reliable service that can run jobs in or out of Azure on a predefined schedule, multiple times or just once. So why not harness this mechanism to schedule Microsoft Dynamics 365 recurring jobs? 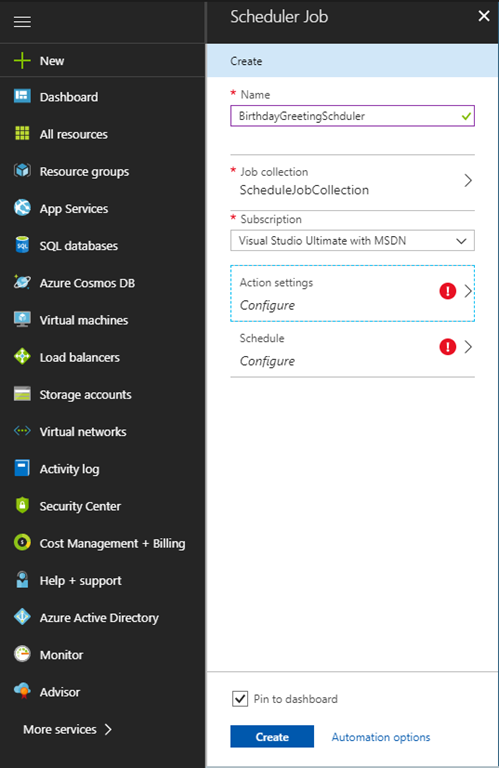 In this post, I’ll demonstrate how to use Azure Scheduler to execute a recurring job in Microsoft Dynamics 365. Each day, automatically email a birthday greeting to contacts whose birthday occurs on that same day. Custom Action dyn_SendBirthdayGreetings: activates a Custom Workflow Activity SendBirthdayGreeting which Retrieve all relevant Contact records by birthdate, creates and sends an email for each contact record. 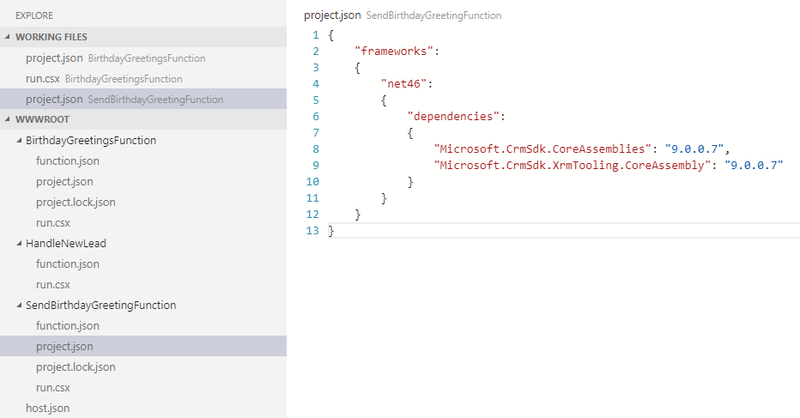 Azure Function BirthdayGreetingsFunction: invokes the dyn_SendBirthdayGreetings Custom Action via Microsoft Dynamics 365 API. Why using Custom Action? 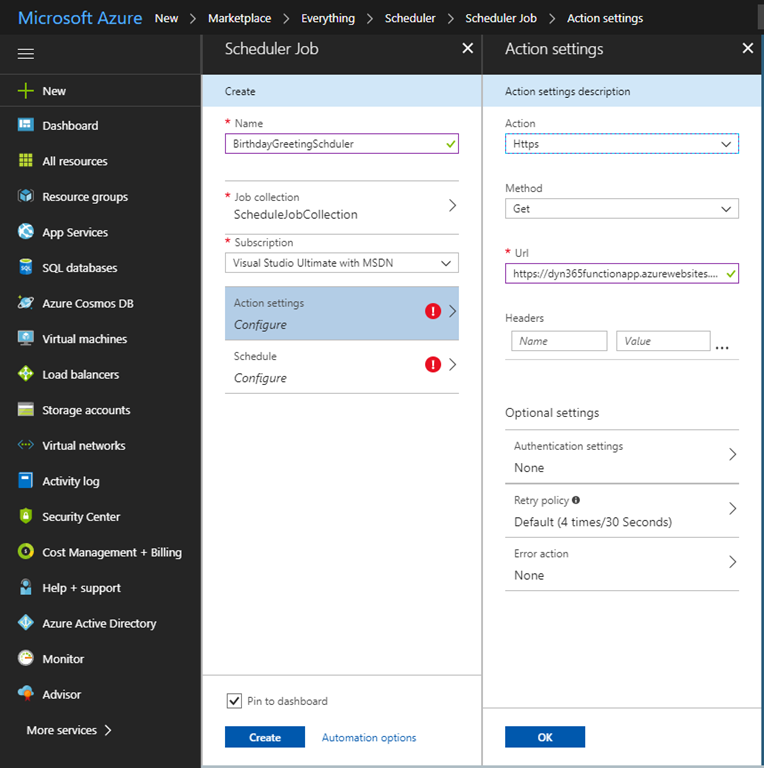 Although it is possible to manage the required business logic in Azure Function, Dynamics related business logic should reside within Dynamics, managed and packaged in a Solution. This way, the Scheduling and Executing components are kept agnostic and isolated as possible and therefore easily maintained. Having said that, you should be aware of the Sandbox Execution Timeout Limitation and consider using Custom Workflow Activity after assessing the business logic at hand. Define dyn_SendBirthdayGreetings Custom ActionDownload, import and publish the unmanaged BirthdayGreetingAutomationSample_1_0_0_0 solution. 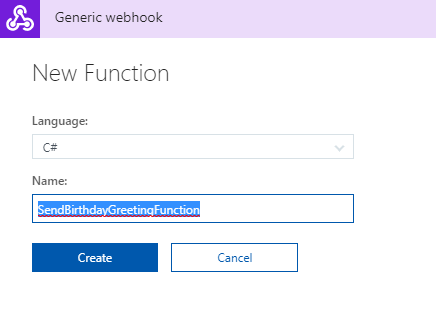 It contains a Custom Action called dyn_sendBirthdayGreeting which will be later called from the BirthdayGreetingsFunction Azure Function. By default, the Custom Action will create a birthday greeting email but will not send it. To change this, disable the Custom Workflow Activity, edit the only step and change the Send greeting email after creation? property value to true. Note that this may actually send email to your contacts. The SendBirthdayGreeting Custom Workflow Activity code can be found here. 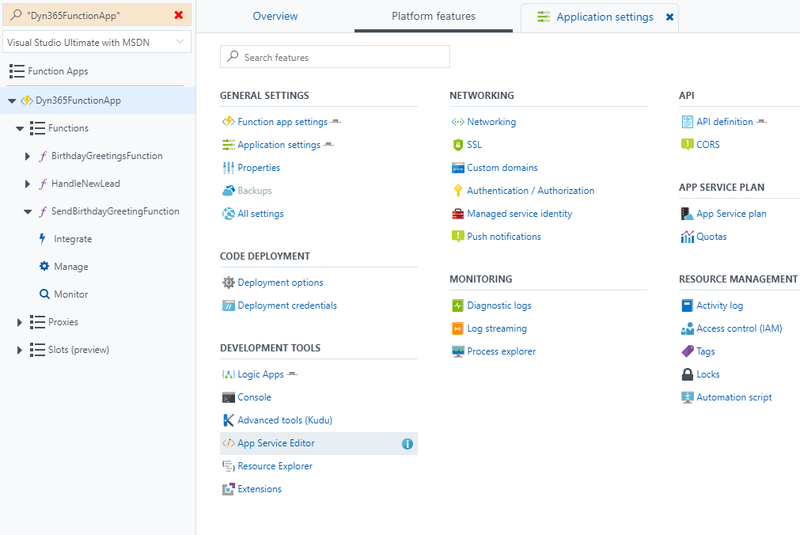 Close the App Service Editor to get back to your function. Selecting your Function App, click the Application settings tab. Scroll down to the Connection strings area and add a new Connection string named TargetOrganization. This will be used to connect and authenticate to your Microsoft Dynamics 365 Organization. Note the data center targeted, crm.dynamics.com is targeting an organization in North America data center. Click Save to save the newly created Connection String. Navigate back to your SendBirthdayGreetingFunction function and replace the default Function code with the following code snippet. 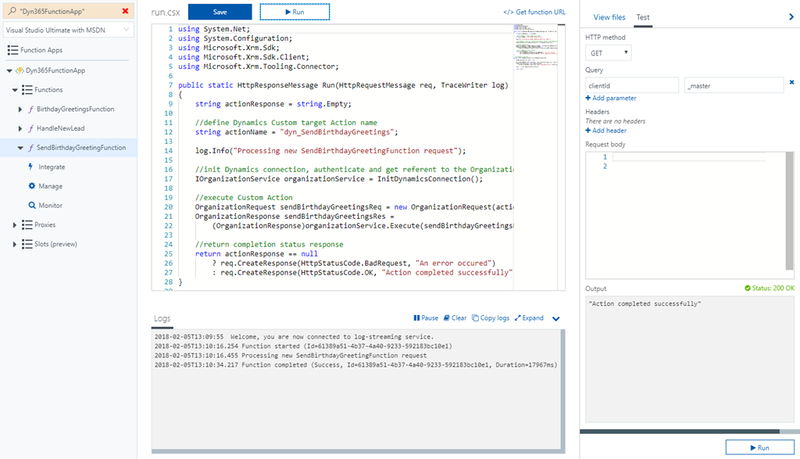 Note that code is executing a Custom Action named dyn_SendBIrthdayGreetings.It also uses the TargetOrganization connection string when accessing Microsoft Dynamics 365 API. Navigate to the Function Integrate area and set the Mode to standard. This will enable the consumption of the function using HTTP GET method. Back at your Function code editor, expand the collapsed Test pane and set the HTTP method to GET. Click Run to test your function. If all went well, a success message will be returned. Finally, click the </> Get function URL button on top and copy your function endpoint address. Define the scheduler name to BirthdayGreetingSchduler. Click the Schedule tile and set the schedule as Recurring, frequency to Days and End to Never. Click the Advanced schedule pane and set 9 in the Hours text box. Click Ok. This will trigger your function every day at 9:00 for unlimited number of times. Check Pin to dashboard and click Create. After a few seconds, you will be navigated to the Scheduler management area. Test To test the complete solution, update a Microsoft Dynamics 365 test Contact record birthdate to match the day and month of the current date.Go back to your Scheduler Job and click Run now.